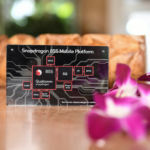 Qualcomm has announced its flagship System on a Chip (SoC) for 2019: the Snapdragon 855. As Qualcomm has basically no competition at the high-end SoC market—especially in the US—the Snapdragon 855 will be headed to almost every flagship Android phone that ships in 2019. 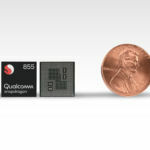 Compared to 2018’s chip, the Snapdragon 845, Qualcomm is promising a 45-percent faster CPU, a 20-percent faster GPU, and a platform that will usher in the era of 5G connectivity. So how is the Snapdragon 855 different from its predecessor, the Snapdragon 845? First, we’re getting smaller transistors. The Snapdragon 845 was built on Samsung’s 10nm semiconductor manufacturing process, but the 855 is moving to TSMC’s 7nm process. A smaller manufacturing process comes with the benefit of lower power consumption and smaller chips, and the 7nm node puts the Snapdragon 855 on par with Apple, which shipped the 7nm A12 Bionic SoC in the iPhone XS earlier this year. 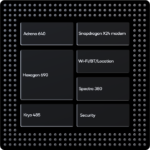 The Snapdragon 845 CPU was branded “Kryo 385” and had four 2.7Ghz Cortex A75-based cores and four 1.8GHz Cortex A55-based cores. 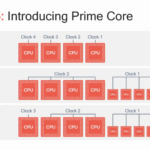 These two CPU clusters split the CPU into “big” and “little” workloads, where four bigger, more power-hungry cores handled heavier processing duties like foreground apps (the A75 cores) and four slower, lower-power cores handled background tasks and idle processing (the A55 cores). 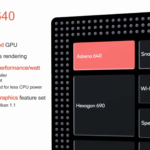 The Snapdragon 855 is still kind of built with this 4+4 core layout, but now one of the big cores has a boosted clock rate. 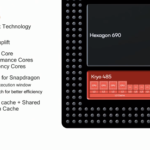 So the new Snapdragon 855 CPU is branded “Kryo 485” and changes to four newer Cortex A76-based cores for the “big” cluster, with three cores clocked at 2.42GHz and one clocked at 2.84GHz. Qualcomm is calling this boosted core the “Prime Core.” The smaller core cluster uses the same four 1.8GHz Cortex A55-based cores as the older chip. The GPU changes from the 845’s Adreno 630 to an Adreno 640 GPU in the 855. Other than promising it will be 20-percent faster and come with Vulkan 1.1 support, Qualcomm didn’t say a lot about the GPU. The company says it leads the industry in performance per watt, and it put an emphasis on “sustained system performance” with its new GPU, so it should throttle less. This should be an improvement for gaming. 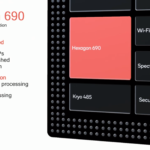 Qualcomm says the Hexagon 690 DSP has transformed from a normal DSP to a more generic processor. The company pitches the component as an “AI platform” thanks to a new “Tensor Accelerator” for neutral network work. The ISP—the chip that powers the camera—is faster, too. It appears Qualcomm will be able to do augmented reality and other camera tricks at 4K 60FPS. For video playback, there’s hardware accelerated h.265 and VP9 decoding, which should help a lot with apps like YouTube. The Snapdragon 855’s Wi-Fi is getting upgraded, too. There’s support for “Wi-Fi 6” (aka 802.11ax) with 8×8 MIMO, which will be the next big mainstream Wi-Fi upgrade over the current 802.11ac. I highly recommend checking out our in-depth Wi-Fi 6 primer from Jim Salter, but basically 802.11ax is more about foundational improvements that will make Wi-Fi work better, rather than dishing up huge speed boosts. Wi-Fi is being dragged into the modern era with novel features like the ability for multiple devices to transmit at the same time and bi-directional communication! 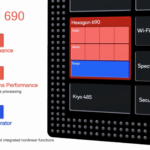 Until 802.11ax, Wi-Fi has been one device at a time, one direction at a time, which is why Wi-Fi is often so terrible.The Snapdragon 855 is also getting support for 60GHz 802.11ay, aka “the next Wi-Gig.” 802.11ay doesn’t have good penetration so it basically needs line-of-sight between devices, but it can reach speeds up to 10Gbps. Like the now-defunct Wi-Gig, someone needs to find a use for this. Qualcomm’s biggest strength in the SoC market is its modem technology and intellectual property, as it’s one of the few players that can build a CPU, GPU, and modem all in a single chip. A one-chip solution offers a two-fold benefit for a device’s battery life: one chip uses less power than a two-chip SoC + modem solution, and the single chip takes up less space, which leaves more room for a larger battery. 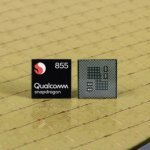 The cellular industry will be all about “5G” millimeter wave connectivity in 2019, and, sure enough, Qualcomm is calling the 855 “the world’s first commercial mobile platform supporting multi-gigabit 5G.” “Supporting 5G” is a lot different from “integrated 5G,” though, and a Snapdragon 855 device with 5G will not get Qualcomm’s single-chip advantage this generation. The 855 will have LTE on-board, as usual, but these first-generation 5G devices will need an extra chip, the Snapdragon X50 modem. The extra chip means 5G is going to be bigger, more complicated, and more power-hungry than 4G, so you’re getting all the downsides of first-generation network technology. 5G uses a much higher frequency compared to 4G—30GHz and above—which means it has very poor penetration and can easily be blocked by buildings or your hand. To get around the “You’re holding it wrong” problem, Qualcomm suggests manufacturers use a “beamforming” technique. This puts large RF modules in all four sides of the phone, allowing it to switch to whichever module your hand isn’t blocking. Again, this means more power usage and more complicated devices.Someone is going to have to pay for all these extra 5G components, and it sounds like it’s going to be consumers. OnePlus CEO Pete Lau recently told The Verge that 5G devices would likely cost $200 to $300 more than 4G devices. 5G networks aren’t really up and running yet, and carriers will only start to launch 5G in select cities in 2019. The good news is that 5G should be optional in 2019. The Snapdragon 855 will come to devices in the first half of 2019, with the Samsung Galaxy S10 a likely first landing spot.